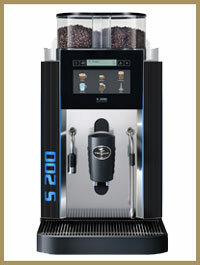 The Rex Royal S200 is a high capacity bean to cup system that uses fresh milk. The recommendation of the manufacturer is that it will cope with up to two hundred and fifty coffees a day and will comfortably dispense a 12oz sized drink. There are a variety of options available with the S200 including a chocolate canister addition that allows the machine to dispense delicious and frothy hot chocolate as well as indulgent mochas. A second soluble canister is available for either powdered milk or extra chocolate powder capacity. A steam arm is another optional extra that allows the user to manually steam milk based drinks and, if there is a requirement to use two different types of coffee beans, then it is also possible to add a second grinder thus allowing the dispense of caffeinated and decaffeinated or dark and light coffee. The touch screen display makes the S200 both visually appealing and exceptionally easy to use even for a novice. 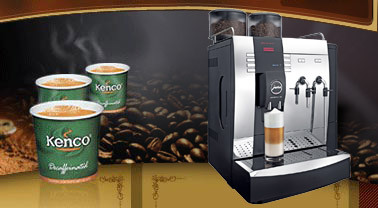 Up to twenty four coffee specialities can be programmed, different sizes of drinks can be offered and indeed there are a range of colours available for the machine to suit any environment. The coffee itself is brewed under pressure to produce a great espresso base for the cappuccinos, lattes and Americanos. All of the cleaning and maintenance programs can be run at the touch of a button, further adding to the user friendliness of the system. Whilst the cleaning process is very simple they must be carried out on a daily basis or there will be reliability issues. As with all coffee machines that are plumbed into the mains water supply the S200 should be fitted with a good quality water filter in order to both improve the quality of drink and head off service issues. The Rex Royal S200 comes with a full warranty and seven day per week maintenance cover as standard. This maintenance cover also includes a preventative maintenance visit every six months. 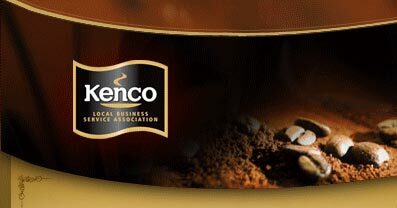 Kenco Local Business Service can provide this range of equipment across all areas of London and into Buckinghamshire, Hertfordshire and Berkshire. We supply all products that are required for use in these machines as well as full training when they are installed. Our base near Hemel Hempstead means that we can supply a great service in towns such as Aylesbury, Tring, High Wycombe and Watford.